Back in 2017, I noted in my year end wrap-up that Korean eateries were making their presence in Edmonton known. 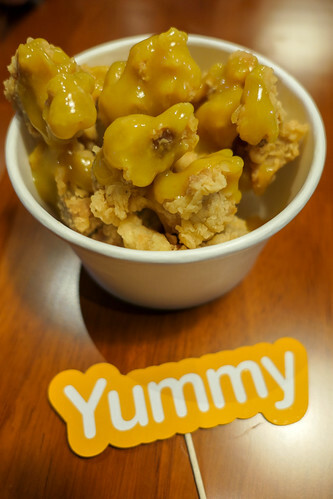 What was particularly impressive was the range of establishments that were opening – mainstream-friendly Korean Fried Chicken and Korean BBQ joints, but also bingsu (Korean shaved ice) dessert bars, Korean soup restaurants and anju (food to accompany alcohol). A year later, Culinaire Magazine published a piece further categorizing the variety of Korean cuisine available in Edmonton and Calgary, which has continued to grow. In fact, a new restaurant specializing in Korean street food is set to open tomorrow, January 24, 2019. Gangnam Street Food is situated in a south side strip mall on 34 Avenue. It is also known as “K-Mall”, in recognition of its cluster of Korean businesses, including bingsu place Let Eat Snow and the newly-opened grocer A-Mart. Gangnam Street Food is the brainchild of the folks behind Dookbaeki and Baekjeong, so they’re already somewhat familiar with Edmontonians’ appetite for Korean cuisine, but this concept brings the team back to their youth. 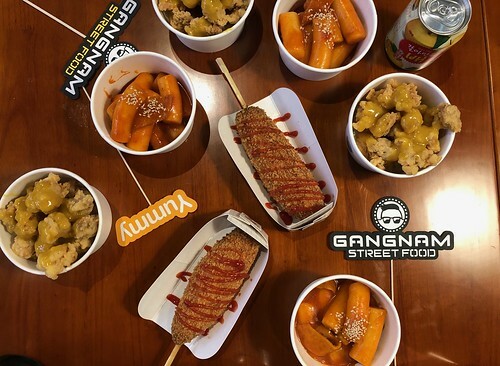 Gangnam Street Food will offer inexpensive dishes found in Korea that are popular with young people; quick handheld bites picked up after school, or before a night out. Dishes will be priced from $4-9, so for the price of one main elsewhere, diners can easily sample several plates. The restaurant is primarily set up for those looking for take-out, but there are also about 30 seats to eat in. In addition, their menu will be available on Skip the Dishes. 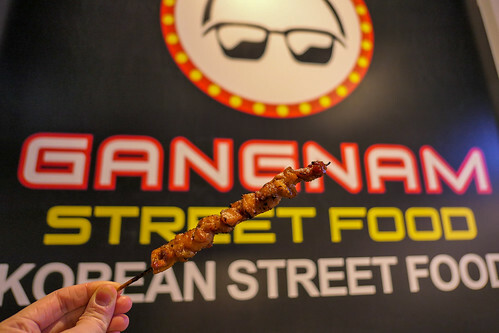 Two weeks ago, I was among a small group that was invited to preview Gangnam Street Food. We were able to try 7 of the dishes (though there will be more on the full menu). It’s no surprise that the deep-fried items we sampled were the most crowd-pleasing overall; they would easily appeal to those unfamiliar with Korean cuisine. 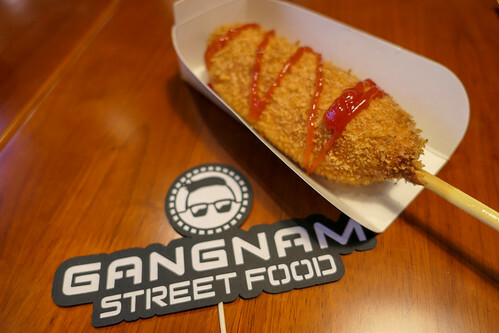 The Korean-style hot dog features a wiener wrapped in mozzarella cheese and house-made dough, then fried. It fared best when eaten right away (which I had failed to do), but I still enjoyed the concept. Similarly, the Dak-gang-jung, or deep-fried boneless and breaded chicken, was straightforward and tasty. Here, it was served with honey mustard sauce, though there were spicier dips available on the counter for those keen for more heat. Gangnam Street Food’s version of Dduck bo kki, was plenty hot for me; the rice and fish cakes were stir-fried with a spicy sauce. When I was first introduced to this dish in Korea years ago, I always opted for the more pedestrian version on menus, so just for the reason of my personal preference, this was my least favourite dish. In addition to the hot dog, skewers also make an appearance as an easy-to-eat meat on a stick. That night, we tried two of their kkochi (skewer). Both were charcoal-grilled, but the chicken was basted in a Korean Bulgogi sauce, while the pork belly had been brushed with a house-made “super spicy sauce”. The portions here were on the smaller side, but would be ideal for those just looking for a snack-sized amount of meat. The spam and sausage cup-bap was the full meal deal. Rice was layered with ham, sausage, stir-fried kimchi, bean sprouts, corn, lettuce, and a pan-fried egg. 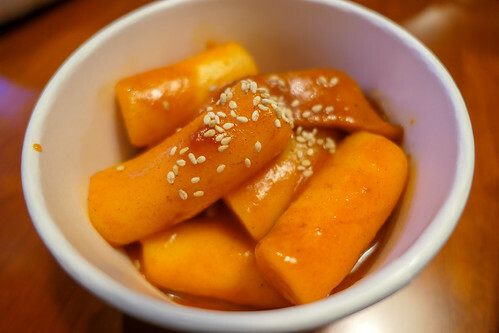 This dish will be very familiar to those who have frequented standard Korean restaurants, albeit in a smaller serving. It was satisfying enough, and helped balance out some of the heavier courses. 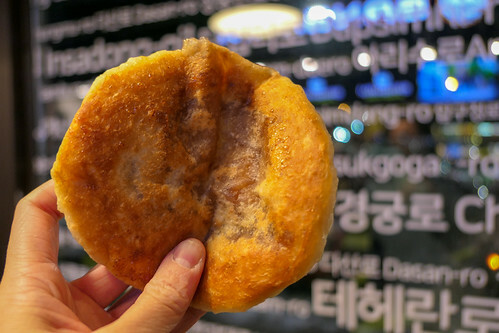 For dessert, we sampled the Ho dduck, a Korean-style pancake with melted cinnamon and sugar filling, served hot. This was also a favourite of the night, unsurprising given the classic flavours, but notable for the dense and doughy texture of the pancake itself. We were told this was perhaps the most difficult recipe to develop, though I can say it was worth their time – I will be returning in the future for seconds! 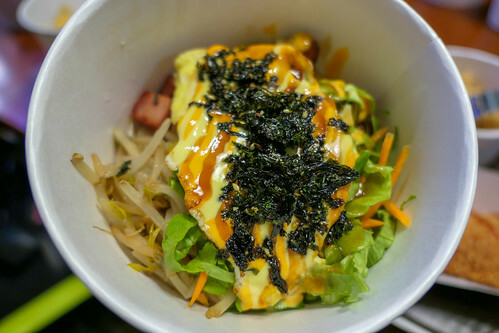 It’s great to see how the Korean food scene continues to evolve and mature in our city, and Gangnam Street Food is certainly poised to help introduce another facet of this diverse cuisine to Edmontonians. Thanks again for having me (and for the very generous $100 in gift cards to their “family” of businesses). Best of luck with the opening!